A combination of delicate lace and georgette come together to create the Charlotte Bridesmaid Dress, a gorgeous vintage inspired gown by Poseur Designs. 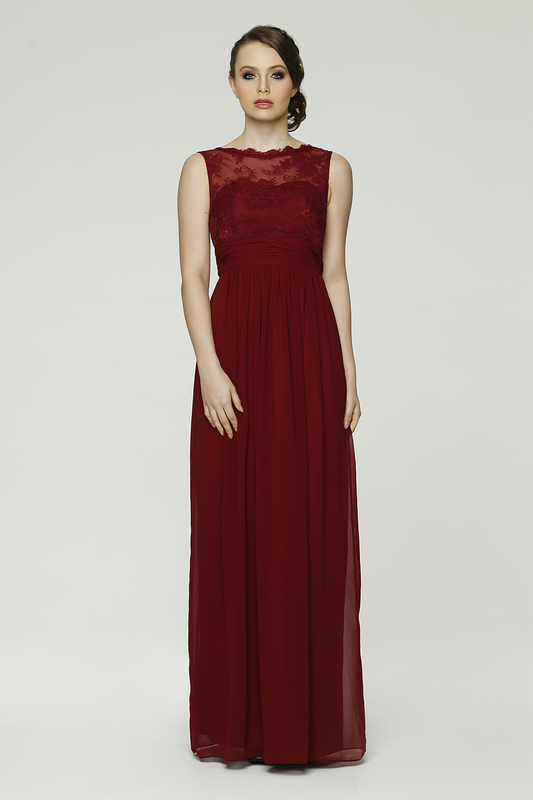 The Charlotte Bridesmaid Dress showcases a romantic and graceful design, inspired by classic vintage. Enjoy the luxury of the delicate lace bodice with its high-cut sheer neckline and eyelash edging, which follows through to the pretty V-shaped back. The sweetheart shaped under-bodice brings an element of romance and a long georgette skirt brings a touch of glamour to the gown. Due to its subtle and refined beauty, and variation in colours, the Charlotte Bridesmaid Dress is the perfect dress for large wedding parties. With 23 colours available, mix and match your bridal party for perfect bridal styling. The gown’s cut and design is flattering to a variety of shapes and sizes (4-30). To figure out your size, measure you bust, waist and hips and refer to the sizing chart – make sure the waist measurement on the chart is the same or larger than your own. Please note custom orders can take 12-16 weeks for delivery.